No need to set the burglar alarm. With this, you can take your house with you. Every time I take a long step up into a Ford Super Duty F250 4X4 Crew Cab I'm reminded why some people with, uh, unresolved personal issues are so attracted to them-and that's before they raise the vehicle another six inches. Even at the stock ride height it's tough not to be noticed. Its sheer width, the massive Freightliner-like grille and tall stance do give the Super Duty F250 an undeniable visual presence. Even charter members of the Anti-Destination League blocking the fast lane pay attention to 3.5 tons of truck filling their mirrors. At night your headlights are about level with their headliner. Most of them are happy to move aside. For model year 2008 the Super Duty gets a cosmetic sheetmetal makeover, a new interior, new options and a slew of refinements. But the big news is an all-new 6.4-liter V-8 turbodiesel, a $6,895 option. Even compared to the previous 6.0-liter, the most recent high-water mark in civilized Ford light-truck turbodiesels, this one is exceptionally refined. The redesign was forced by the Feds' insistence on the introduction of new fuel with ultra-low sulphur content, making every automotive diesel noncompliant almost overnight. Ford concentrated on optimizing the combustion process while also slashing exhaust particulates. A common-rail injection system pressurizes fuel to 26,000 PSI and injects it into the cylinders through unique Piezo-electric injectors. These can deliver as many as five injections per combustion cycle. The 390.5 cubic-inch V-8 is force-fed air by sequential turbochargers packaged inline as a single large unit. A small electronically-controlled, variable-geometry turbo pressurizes intake air at low engine speeds as the big primary turbo comes to life. The two operate in tandem through the middle of the torque curve until the primary turbo takes over at higher revs. A maximum 42 pounds of boost helps the 6.4-liter to generate 350 hp at 3000 rpm and 650 lb-ft at 2000 rpm. I suspect both numbers can easily be raised whenever Ford feels the need. Although it may not impress non-technical types, the engine compartment layout is excellent, both functionally and aesthetically. Fuel lines, wiring and hoses are all routed neatly, the turbos mount on a nicely-finished casting and their complex plumbing is tucked away unobtrusively. There's even a clever liquid-to-liquid turbocharger center- bearing cooler with integral water reservoir, thoughtfully mounted where you can reach it without using an 8-foot step ladder. Radiator capacity was increased by one third, a larger water pump nearly doubles coolant flow and the fluid coolers for engine, transmission and power steering pump are huge. The thick air-to-air intercooler measures nearly two feet square, bigger than the radiator on several cars I've owned. Ford says the cooling system was designed to accommodate the 33,000-pound GCWR of the F-550 chassis cab and I seriously doubt that they're understating the case. There's a tangible payoff for the high-tech injection system: remarkably little diesel clatter. First-generation 7.3-liter Power Stroke turbodiesels (the 444-T International Harvester engine) were so loud I got complaints from the neighbors. The 6.0-liter was far quieter. And the 6.4-liter's noise level is significantly lower than that, not very far above a gas motor's. Another benefit of the sophisticated injection is near-instant startup even at low ambient temperatures. After an overnight, 30-degree cold soak my test truck lit off immediately, without even waiting for assistance from the glow plugs. From inside, engine noise is almost imperceptible. This is due in part to Quiet Steel, a composite laminated steel sheet that's used for the instrument panel. There's also a rear bulkhead panel to attenuate sound plus thicker side glass and extra sound-deadening padding in the IP and on the floor. At 70 mph cruise I recorded a noise level of 73 db(A), one dB less when coasting. This is passenger-car territory and exceptionally low for a diesel pickup. has a comprehensive set of gauges to monitor the powertrain and there's a tow/haul button on the shifter for the five-speed automatic. The seats, both front and rear, are comfortable and all adjust for rake. Rear passengers get a generous 41.8 inches of legroom, slightly more than those in front. The driving position is excellent with the important controls intelligently located and easy to operate. Power-adjustable pedals help tailor the position to personal preference. The touch-screen navigation system ($1,875 and it includes a 6-CD Audiophile sound system) is useful although it eagerly attracts fingerprints. A reverse parking sensor system ($245) is of genuine use on a vehicle this large, particularly if you park by ear. When fitted with front captain's chairs and full-size rear console it's a four-passenger truck. That seems a bit odd for a 6,900-pound, 22-foot-long vehicle with a 146-inch wheelbase. But buyers who order a Super Duty in this configuration aren't concerned about shuttling passengers around town. They're more interested in 15,700 pounds of towing capacity with just enough seating to get themselves and a few friends plus their toys to a recreation area for the day. To that end, the test truck was optimized for serious towing chores. It was fitted with a bank of four upfitter toggle switches on the dash, fused high-amp auxiliary circuits for routing power to a trailer, electric winch or elsewhere. Each outside Powerscope trailer towing mirror had an electrically-adjustable main section, a manual convex lower section and could be extended 2.75 inches or folded flat using the multi-function switch. There's also a 200-amp alternator and integral trailer brake controller. The 6.75-foot-long bed was fitted with the optional ($250) multi-piece extender that stretches usable length for those rare occasions when a portion of the truck's 2.5-ton payload capacity might be employed. It has to be swiveled from its stowed position and assembled for use, but it works well enough. An integral step ($375) folds out of the lowered tailgate. Next, a tailgate-stowed pole can be raised into the upright-and-locked position. Now you can step up into the bed without unceremoniously clambering over the step bumper. Four-by-fours now have coil springs for the solid front axle. The rear leaf springs are 8 inches longer and are anchored that much farther forward on the frame in the interest of a better ride. Shock tuning has also been massaged. These changes, plus front and rear anti-roll bars, keep body motions well controlled and noticeably improve ride quality. This is the first heavy-duty 3/4-ton 4WD pickup I've driven whose ride quality when empty rivals that of a softly-sprung light-duty half-ton. Considering the near-8-ton towing capacity, it's a surprisingly comfortable ride. I'd like to express equal enthusiasm for the steering. But the test truck's recirculating ball setup had an unusual amount of on-center slop, even for a truck. Whip the wheel back and forth over a 25-degree arc and absolutely nothing happened. That vagueness made the vehicle a chore to drive, requiring constant corrections to maintain course. Until I drive another Super Duty I'll have to assume that this one was an exception. 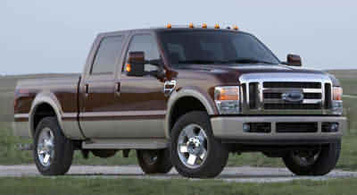 According to Ford, nearly three-quarters of all Super Duty trucks sold are diesel-powered. Small wonder. I averaged 11.8 mpg in city driving and 13.9 on brisk freeway jaunts. Even heavily loaded, those numbers are unlikely to shrink dramatically, as would those of any gas engine, including the 6.0-liter, 362 hp Triton V-10. The new clean-diesel's 650 pound-feet of torque give this massive vehicle almost sprightly performance. Despite its heft, the F250 reached 60 mph from rest in 9.27 seconds and cleared the quarter mile in 16.92 seconds at 82.5 mph. During acceleration runs I learned that traction control, a $130 option, is a wise investment. Without this assistance, the Ford spun its 275/65-20 rear tires long enough to hobble quarter-mile times. And this was with the optional locking 3.73 rear diff. With the available 4.30 gears, much of first gear would have gone up in smoke. At $57,225, including a lofty $925 shipping charge and nearly 19 grand worth of options, this Super Duty F250 is knocking on the high end of the pricing scale. If you can forgo the $995 power moonroof and some of the other gadgets, the tariff can be whittled down some. Not that most buyers will care. You'd need to travel to the moon and back to break even on the diesel's extra cost but that won't matter either. Think of the upside: while engaged in more Earthly pursuits like towing your 25-foot Wellcraft, I can't think of many tow vehicles this sumptuous and capable.